There is a continuing need for practical chip-based sensors that can be used at the point of care to detect cancer and other diseases. An innovative way to inject light into tiny silicon microdisks could help meet this need by bringing down the cost and improving the performance of chip-based biosensors. The advance could eventually lead to a portable and low cost optical sensor for early-stage cancer diagnostics. Microdisks are a type of microscale resonator that use the whispering-gallery optical effect to confine and enhance light that enters the disk. Just as the curved walls of a whispering gallery carry sound waves to allow whispers to be clearly heard across a room, the curved inner surface of a microdisk carries light waves across the disk, enhancing the light. This allows the microdisk to boost a light-based signal coming from a cell, protein or virus of interest, allowing more sensitive detection of subtle changes associated with diseases such as lupus, fibromyalgia and certain heart problems. "Although there are whispering gallery mode micro-resonators that can already be used to resolve single molecules, their application is limited by problems in device repeatability, stability and wavelength range," said research team leader Qinghai Song from Harbin Institute of Technology, China. "Our new design enables excellent device performance that works with a variety of wavelengths with low cost, higher stability and better device repeatability." In Optica, The Optical Society's journal for high impact research, the researchers detail their new end-fire injection configuration, which offers a simple, cost-effective and efficient way to get light into the microdisk resonator. They also show that devices using microdisks and end-fire injection can be used to detect temperature changes and the presence of nanoparticles. The researchers' ultimate goal is to use their new end-fire injection technique to create a portable and low-cost sensor that can detect changes in cells that are early indicators of cancer. However, they point out that the new light-coupling configuration could also be useful for integrated photonic circuits for communication applications and a variety of sensors such as those used in homeland security or environmental monitoring. Most microdisks are designed so that light is indirectly injected into the microdisk using an optical phenomenon known as evanescent light coupling. However, this method requires very precise alignment between the waveguide and the microdisk, which increases manufacturing costs and makes devices susceptible to stability problems. The researchers' end-fire injection technique uses a waveguide that is directly connected to the edge of the microdisk. Although light that is exactly perpendicular to the disk's side will bounce off the interface, using light angled just slightly less than perpendicular induces a counterintuitive phenomenon known as laser time-reversal. This creates a laser that absorbs light rather than emits it, allowing the light to efficiently enter the microdisk. "Because this configuration doesn't require any parts that are smaller than 500 nanometers, it can be fabricated with low-cost techniques," said Song. 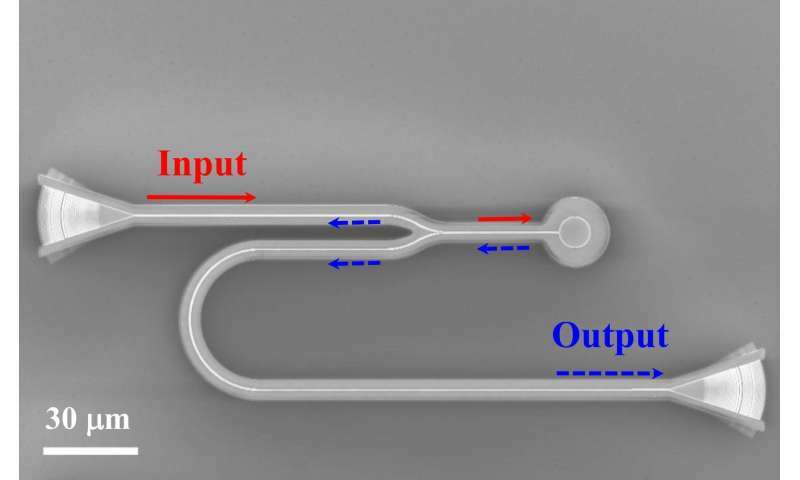 To test their design, the researchers fabricated a device that included a microdisk with a 5-micron radius connected to a waveguide. To measure the end-fire injection, they incorporated a Y-splitter that allowed light passing through the splitter to be injected into the microdisk and then be transmitted out of the microdisk along the same waveguide. Recording the spectrum coming from the Y-junction showed that light could be coupled into the microdisk with an efficiency as high as 57 percent. They also showed that the device exhibited a high Q-factor, a measure of how well the microdisk confines and amplifies the light. 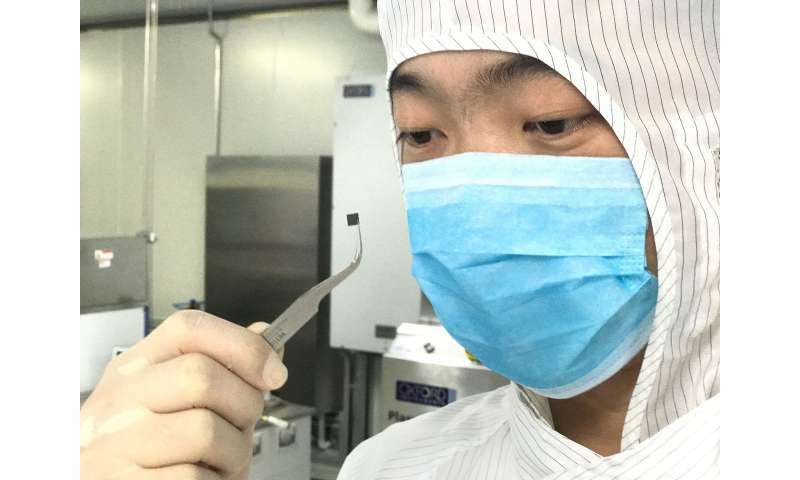 In addition, the device maintained good performance parameters even with fabrication deviations such as increasing the waveguide width from 400 nanometers to 700 nanometers. "We show that the performance of the end-fire injection technique is comparable to that of conventional microdisks but with improved robustness and reduced cost," said Song. "Overall, our findings show that microdisks are now ready for commercial applications." 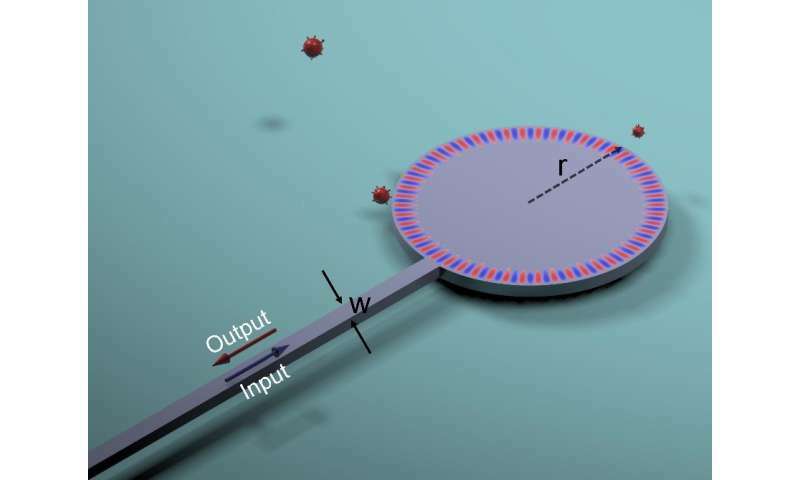 The researchers also demonstrated that sensors incorporating microdisks and end-fire injection could detect the presence of multiple large nanoparticles as well as single nanoparticles as small as 30 nanometers. They are interested in using cell-derived vesicles that are around 40-to-100 nanometers to detect cancer, which should be possible based on these results. The researchers are now working on other parts of the device that would be needed to use the end-fire injection technique to create a portable and low-cost sensor that can detect early indicators of cancer.